The LEAF Learning Garden is a demonstration space that allows people to experience and learn about a wide array of native species that provide habitat for wildlife such as birds, butterflies and other pollinators. The garden is cared for by community stewards using permaculture techniques such as mulching, water conservation strategies, feeding the soil with compost, and ensuring resilience through biodiversity. Designed as a welcoming space, we hope that the garden will inspire others to create similar habitat gardens in their own yards following the same principles. The garden is located in Wychwood Barns Park, outside the internationally renowned Artscape Wychwood Barns, a multi-use public facility in the city of Toronto and home to the LEAF office. To find the garden, look for our beautiful mural created and generously donated by designer James Toye Mclean with materials donated by Dulux Paints on St. Clair Ave. West. His whimsical and playful imagery draws visitors to the garden with a warm and colourful welcome. The garden was originally designed by our dedicated group of volunteer stewards. We’ve decided to expand and our first step was to contact the experts at Genus Loci Ecological Landscapes Inc. They generously provided us with a beautiful design for expansion. We’ve started by laying a mulch pathway along the wooden fence that leads to the garden and creating seating for our outdoor classroom. Over the next few years, we’ll be working to raise the funds needed for further improvements. For now, this video will show you how far we've come! Love to garden? Join us! 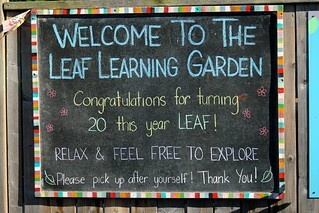 LEAF's Volunteer Garden Stewards help us maintain our learning garden. Whether it's planting, weeding, mulching, making tags for plants, preparing the garden for spring or putting it to bed for winter, our volunteers are in on the action. If you have a passion for helping things grow, we'd love to have you on our team! Fill out the volunteer application form by clicking the button below, and indicate that you're interested in becoming a garden steward in the Urban Forest Demonstration Gardens.